Happy Halloween! As a garden writer, my email sometimes brings strange and wondrous things. 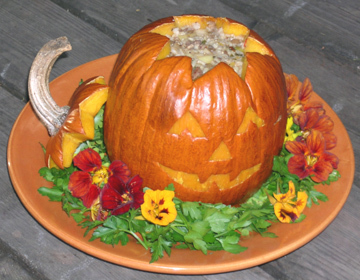 This has been a bumper year for pumpkins in Western Oregon but here’s a bit of fall fun that sounds like a blast. Just follow this link to read about a pumpkin regatta. The tradition of the Three Sisters in Native American Gardening refers to the practice of planting a mound of soil with 5 to 7 corn plants in the center. After the corn grows 6” tall 7-8 beans are planted around the corn which supports the beans. A week later 7 or 8 squash or pumpkin seeds are planted around the outer edge of the mound. The beans provide a nitrogen boost for the corn and the broad squash leaves suppress weeds and conserve moisture. 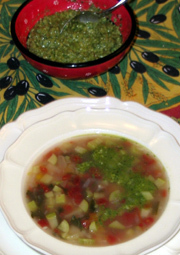 Additionally, the three vegetables form a nutritional compliment. After buying a few bags of fire roasted chiles at our local farmers market I wanted to make something new and special with them and use up some odd bits in the refrigerator. 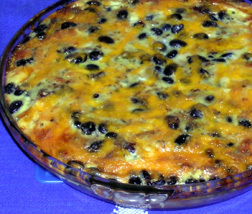 The result, featuring corn, beans, and squash is reminiscent of both a chile relleno casserole and stacked enchiladas. Preheat oven to 350 degrees. Remove skins and seeds from roasted chiles, slice lengthwise into 1” strips. Whisk together, eggs, milk, flour, cumin and oregano. Take a 10″ glass pie plate or shallow casserole and lightly oil. Arrange half the tortilla pieces in bottom of casserole. Then lightly layer with half the cheese, ½ the peppers, followed by 1 cup beans and ½ cup cubed squash and all the chicken. Cover with 1/2 egg mixture. Give the dish a gentle shake so ingredients are evenly layered and tortillas begin soaking up egg mixture. Repeat layering beginning with tortilla pieces followed by remaining ingredients. Reserve 1/3 cup of cheese to sprinkle over the top as the last step. Bake on middle shelf in preheated oven for 45 minutes. Serves 6. My beans were seasoned with salt, onions and garlic so I did not include salt, you may wish to add ¼ teaspoon. 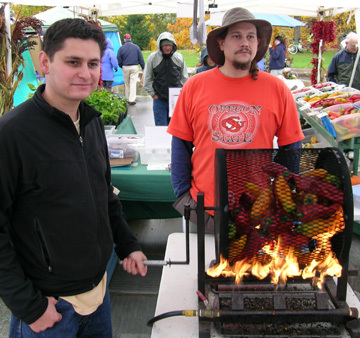 Last Saturday at our Corvallis Farmers Market many of us were following our noses to a special attraction, flame roasted chiles. 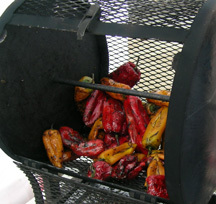 A metal mesh roaster was full of peppers turning over a propane flame. The vendor, from Crossroad’s Farm, was filling plastic bags with chiles all carefully labeled. The beauty of a tumbler roaster is you can roast many peppers at once. Roasting chars the skin for easy removal, and seems to intensify the flavor without fully cooking the peppers. If you want to try roasting at home on a grill or under a broiler it’s pretty easy. To grill, set close to the flame and use tongs to turn chiles so both sides have blistered slightly charred skin. To oven broil, place peppers on an oiled cookie sheet under a hot broiler and turn with tongs after 4-5 minutes. Cook each side until skin is blistered and slightly blackened. Place 6-8 roasted peppers in ziplock bags, they will sweat and further loosen skins. These store in refrigerator for a week and can be frozen for a year. When ready to use slip off skins, split open and remove seeds. I usually cut off the stem end unless I’m making chile rellenos where the attached stem adds personality. We’ll harvest peppers until frost and tuck several bags in the freezer as pantry food. Use with eggs, in casseroles, quesadillas, rellenos, salsa and countless other dishes where rich roasted peppers add that special flavor. I’m trying to address the problem of deer in the garden in a constructive manner and not just rant. Our in town garden, mostly of edibles, is favorite target of the rising deer population. Because it is rather large and spread out the cost of fencing is prohibitive. So what do we do? Two days ago, it was dry and I sprayed a sticky blood based product all around, especially the areas where I know deer walk. Roses and pansies that the deer browse have been sprayed. It doesn’t look very attractive but should keep them from being browsed. The straw bale garden now is caged with wire fencing and covered with bird mesh. This too was sprayed as there will be nothing harvested from eaten down bales for a few months. Our raised beds are covered with bird netting which is nearly invisible and the best thing I’ve found for protecting areas. It needs to kept quite loose but fastened in place. If it is taut the deer will start ripping away at it, when loose they apparently don’t like it slipping under their hooves and are afraid of getting tangled into it. I used this at a public garden planting we maintain and planted a twenty foot circle of salad greens this summer. It took two overlapping packages of bird netting pegged in place with small bamboo stakes. This is the first year we’ve successfully protected this area. I know there are recipes for eggs and pepper spray, bloodmeal, and other potions but in a wet climate like Oregon they tend to wash away. Perennial herbs, with their strong aromas aren’t much bothered. Our herb garden which include various edibles was heavily damaged. We had prepared it for a photo shoot and they ate down some plants enough that we had to replace them on short notice. An evening ritual became surrounding this area with a large circle of wire. Since a newly planted fig was just defoliated last night it will get the wire circle treatment and such damage this time of year won’t really harm it. I’m tired of the deer and wish they would go away. I certainly don’t feel one with nature when they go traipsing down our street at high noon. Some days begin with a good chuckle. This morning I opened BBC news and read about a terrorist alert in London. You can go to this url for the full story:Burning chilli sparks terror fear. http://news.bbc.co.uk/2/hi/uk_news/england/london/7025782.stm It really does sound right out of Monty Python. 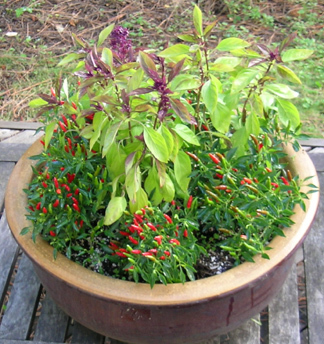 However, since this blog is The Gardener’s Pantry, I remembered my container planting of Demon Red Thai Peppers surrounding a plant of Thai Basil. This container will move indoors for a few months as I continue to harvest those little red hots and basil. When I bring a container indoors I check it for insects and anything that might be living near the drainage hole. Insects on peppers and basil aren’t usually much of a problem outdoors but may emerge inside your home or greenhouse. Keep an eye on plants and wipe off any eggs you see on the underside of leaves. if you see those little round pillbugs coming out of the drainage hole place the container on a tray filled with cornmeal. If something is flying around or on the leaves figure out what it is before trying to treat the problem.